Thin Lizzy – The Ultimate Listening Guide 1969-2011 is the story of rock’s mightiest mavericks, an Irish club band that became one of the biggest groups in the world, and certainly put on some of the greatest live shows ever. Album by album, the story of Thin Lizzy unfolds, a biographical discography that pinpoints the highs and lows of their recorded output with honesty, expertise and an undying passion for the music. Updated to include the recent Deluxe Edition remasters of Lizzy’s greatest records, “The Ultimate Listening Guide” also features a rare and largely unpublished 1980 interview with Phil Lynott, talking through his own thoughts and opinion on the band’s music. 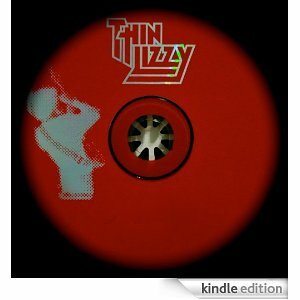 A must for every Thin Lizzy fan! Lynott’s band, Thin Lizzy, were huge at the time. Four of their last five albums had gone Top 10 in England (the odd one out reached #11); they’d conquered most of Europe, the Far East and America; and their next album, Chinatown, was just a few months away. And they had a great story. Prior to finally breaking through in 1976, with the still classic Jailbreak album, they’d spent half a decade struggling to shrug off the cult status that seemed to be the lot of every Irish rock’n’roll band; struggling, too, to forget the one brush with stardom that they had enjoyed, in 1972, when a rocked-up rearrangement of the traditional “Whisky In The Jar” convinced a generation that they were some kind of freakish, funky folk band, a full decade before the Pogues became one. Since that time, of course, all expectations had sailed by the board. Jailbreak was followed by Johnny The Fox; “Dancing In The Moonlight” brought funk to the punk rockers; and the double Live And Dangerous album came so close to topping the chart that most people think it did – and it probably still could. When Classic Rock magazine polled its readers to discover the greatest in concert album of all time, Live And Dangerous ran away with the poll. We met up in a west end pub, me clutching a pen and notepad, Lynott apparently armed with a telepathic link to the barman, who kept a constant stream of spirits flowing into his glass. What struck me most, however, was the ease with which Lynott accepted that the “big shot writer” he’d been told was profiling him for some unnamed mega-magazine was, in fact, an unpublished 20-year-old who didn’t even have the ghost of a commission to justify his presence. Instead, he just sat down, asked me what I wanted to know – and then started talking for two, maybe three hours. By the time the evening was over, I had scarcely got a question in, but he’d told me everything regardless, and I spent the next three days transforming my scribbled notes and home-made shorthand into a legible, and super-lengthy account of… his life, his band, his hopes, his plans, his music, his career – “the big picture” was a phrase Lynott used over and over, as though everything he’d accomplished so far, and all that he wanted to do in the future, was part of some vast secret masterplan that would only be revealed once it was complete. The interview was never published. Chinatown was released that October, and was roundly dismissed as the worst record the band had ever made. Magazines that I thought would have been falling over one another to buy the Thin Lizzy story were, instead, falling over one another to avoid it; and, though the group would swiftly return to commercial favour, a couple of dozen tightly handwritten pages worth of fascinating interview, revealing anecdote and even a smattering of self-analysis would spend the next quarter-century tucked away in a folder… 25 years, during which the legend of Phil Lynott and Thin Lizzy has exploded beyond anybody’s wildest expectations. The man and the music alike are immortal. A movie based on his mother Philomena’s biography of her son, confirmed the legend; Jailbreak and Live And Dangerous routinely haunt the upper echelons of sundry “best rock albums of the 70s” lists; while every year seems to bring a new Lizzy compilation. An entire new Thin Lizzy line-up – minus, of course, both its most famous member and its most remarkable guitarist, the late Gary Moore – still tours to rapturous applause. Amid all this, the Thin Lizzy story has, of course, been recounted by various authors and journalists, each one drawing upon a vast circle of friends, acquaintances and newspaper cuttings to document Lynott life and career. He has been portrayed as a poet, a warrior, an iconoclast and a hero. One voice, however, is conspicuously absent from all of these accounts – Phil Lynott’s own. This book rectifies that omission. Built around that long ago interview, it tells the Lizzy story from Lynott’s own perspective, the events that he considered moulded it, the songs that he believed shaped it, and some surprising sidelines that those other biographies all but skip over. It also stands alone in its emphasis on Lynott as a member of a working rock’n’roll band – which was how he preferred to think of himself, and examines, in detail, all that Thin Lizzy achieved, what they changed, and what they meant. For a band as beloved as Thin Lizzy are, it is surprising how little attention has been devoted to what made (and continues to make) them so popular. There is no question that Lynott himself was a very complicated character. But Thin Lizzy were an equally complicated band, with a 14-album career that – both during Lynott’s lifetime and thereafter – has never been afforded the critical and historical respect and appraisal that it deserves. We will never discover what Lynott’s own “big picture” was. But this book documents as much of it as he was able to complete.